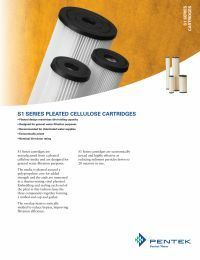 S1 Series cartridges are manufactured from a pleated cellulose media and are designed for general water filtration purposes. The media is pleated around a polypropylene core for added strength and the ends are immersed in a thermo-setting vinyl plastisol. Embedding and sealing each end of the pleat in this fashion fuses the three components together forming a unified end cap and gasket. The Pentek S1-20BB filter media is pleated around a polypropylene core for added strength and the ends are immersed in a thermo-setting vinyl plastisol. Embedding and sealing each end of the pleat in this fashion fuses the three components together forming a unitized end cap and gasket. An external netted sheath helps retain uniform pleat spacing in high flow and pulsating flow streams. The overlap seam is sonically welded to reduce bypass improving filtration efficiency.